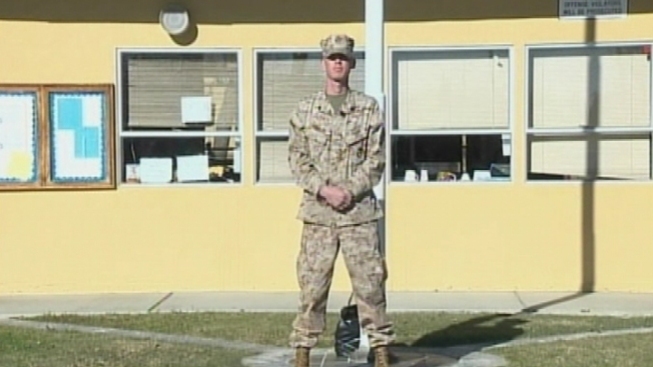 Marine stood outside NorCal school in an effort to help students feel safe in the wake of the Newtown shootings. A former Marine applauded for voluntarily guarding a central California elementary school apparently misrepresented his service history, U.S. Marine Corps officials said Thursday. Craig Pusley showed up for a second day of guard duty Thursday at Hughson Elementary School just southeast of Modesto, this time in civilian clothes after wearing military fatigues the day before. But he departed mid-morning after Hughson Unified School District Superintendent Brian Beck questioned his military background and asked him to leave the school grounds, district officials said. On Wednesday, Pusley, 25, told The Modesto Bee he was a sergeant in the Marine Reserve and had deployed to Iraq and Afghanistan. Pusley also said he was unemployed and living with his wife and 3-year-old child off of his reservist pay. But Capt. Gregory A. Wolf, a Marines spokesman, told The Associated Press on Thursday that Pusley never served overseas and was discharged in 2008 as a private after serving less than a year at the Marine Corps Recruit Depot in San Diego. He also is not a reservist. Wolf said a Marine Corps order prohibits former Marines from wearing their uniform in public, except for military funerals, memorial services, weddings, inaugurals, and parades on national or state holidays. Pusley did not respond to calls for comment from the AP. Marine Corps officials declined to say whether Pusley would face any legal repercussions for lying about his deployment history. Earlier this year, the U.S. Supreme Court struck down a law aimed at people making phony claims of heroism on the grounds that it violated First Amendment free speech rights. Laura Fong, the principal at Hughson Elementary School, wouldn't comment on the controversy Thursday because she said she didn't know all the facts. But she said it was a ``very heartwarming thing'' when the former Marine showed up Wednesday, and his presence made her and the staff feel safer. Parents in the small agricultural community also thanked Pusley for guarding their children and bought him cups of coffee. Pusley told the Bee that he had responded to a call on Facebook for veterans to help protect schools in the wake of the mass shooting in Connecticut last week. A Facebook group called Veterans on Watch, created this month, has called for stationing an armed Marine or any other veteran in every school to prevent shootings. The group is circulating a White House petition that calls for the employment of competent veterans as armed security guards in America's schools, and 2,239 people have signed it so far. WSMV-TV reported that another former Marine, Staff Sgt. Jordan Pritchard, also stood guard in front of Gower Elementary in Nashville, Tenn., on Wednesday. Pritchard, who has two children at the school, said he wanted to provide extra security to students and teachers. Wolf, the Marines spokesman, said the Marine Corps contacted Pritchard, requesting that he stop wearing his uniform outside the school. At no point was the former Marine asked to stop standing in protection of his son's school, Wolf said, and the Marine Corps is not investigating Pritchard or Pusley. According to the Official Military Personnel File, Pritchard served from 2003 to 2011 as a chemical, biological, radiological and nuclear defense specialist. He is a staff sergeant and was deployed to Afghanistan in support of Operation Enduring Freedom.